The Nyngan solar plant in western New South Wales began generating power into the National Electricity Market, with the first of the 25MW completed to date feeding into the Australia’s main grid. According to Reneweconomy, far 350,000 solar PV panels have been installed by First Solar, with four times that much to be completed in the coming the months to take its nominated capacity to 102MW. It is the first of two plants being built by AGL Energy, with the 53MW Broken Hill plant also under construction. Nyngan is the first solar plant to be visible on the Australian Energy Market Operator’s market, as this graph provided by NEM Watch shows. 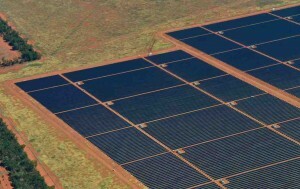 It is thought that there are several dozen large scale solar projects in planning mode – ranging from several MWs to “mega projects such as a 2GW plan for western Queensland, but most are on hold because of uncertainty about there renewable energy target. The Nyngan and Broken Hill projects are being supported by funding under the government’s now defunct solar flagships program, with the funds now managed by the Australian Renewable Energy Agency. The only other large solar plants being constructed are in the ACT, under the territory’s solar auction process. AGL’s head of merchant energy, Anthony Fowler, said this is a significant milestone for Australia’s largest utility-scale solar PV plant. “First generation represents a great achievement for all the project stakeholders. It has required close coordination between local electricity distributor Essential Energy, the Australian Energy Market Operator (AEMO), project partner First Solar and AGL to facilitiate this successful milestone,” Mr Fowler said. The NSW Government, which contributed $64.9 million towards the $290 million plant, said it was strongly committed to the transition to renewable energy through projects such as this. NSW Environment minister Rob Stokes said there are an estimated 13,000 jobs supported by renewable energy in NSW, mostly in regional areas. “The development of projects in regional NSW has the potential to provide traditional farming communities with alternative income streams that are not rainfall dependent,” Stokes said. Jack Curtis, First Solar’s Asia-Pacific regional manager said the first generation at Nyngan represents an important milestone, especially as it relates to the broader power sector’s adoption of utility-scale solar as a meaningful contributor to Australia’s generation mix. “AGL’s solar project will help bring down the cost of similar plants, making them more competitive. In addition to creating jobs, boosting skills and contributing to local communities, the development of utility-scale solar is vital to a diverse energy future,” Frischknecht said. It is thought that there are several dozen large scale solar projects in planning mode – ranging from several MWs to “mega projects such as a 2GW plan for western Queensland, but most are on hold because of uncertainty about there renewable energy targe.